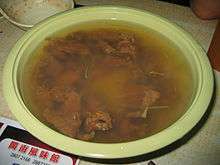 Gēng (Chinese: 羹; pinyin: gēng; Pe̍h-ōe-jī: keⁿ/kiⁿ) is type of thick soup found in Chinese cuisine. Its thickening agent is usually starch which makes the soup translucent and smooth. Many soups can be cooked in this way, such as expensive shark fin soup, Madame Song's fish soup (宋嫂鱼羹), and corn soup. Geng dishes have been important in Chinese cuisine since early dynastic China, during or prior to the Shang Dynasty (1600BC -1046 BC). 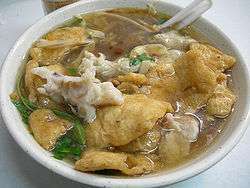 In the past, the term "Geng" was used to refer to any cooked soup or stew, with households serving it daily and for festive events. In modern times, geng dishes consist of different ingredients commonly found in the night markets of Taiwan, and quite commonly in Fujian and Taiwanese cuisine. In Taiwan, the character for geng is sometimes written as "焿" and sometimes as "粳". The Lao (ແກງ, kǣng) and Thai language (แกง, gɛɛng) terms for stew or soup, are believed to have been derived from the Middle Chinese pronunciation of geng (羹). "Share a cup of Geng" (分一杯羹): To boldly partake in a pool of profit or spoils, regardless of the pleasantness of the source of these profits. "Shop-closing Geng" (閉門羹): To shoo-off customers or guest that a host does not wish to receive by a disingenuous action or excuse. "Washing hands to make Geng" (洗手作羹湯): From a poem of Wang Jian, implying the trials of a new bride to appease and gain acceptance in her new family. The traditional Chinese spoon is called "diào gēng" (調羹), which means "the implement that carries geng". ↑ Downer, G.B. (1963). "Chinese, Thai, and Miao-Yao". In Shorto, H.L. Linguistic Comparison in South East Asia and the Pacific (PDF). School of Oriental and African Studies, University of London. pp. 133–139.